17 Repubs crossed party lines, the Senate will vote on it tomorrow - or try to anyway. Repubs say it's dead on arrival at the Senate. Question for those who are old enough to remember: While many have derided this as a meaningless vote, it feels like it means something to me, like this represents a gathering of momentum. Do you agree and was there a moment during the Vietnam era that felt the same? Tet Offensive? 17 Repubs crossed party lines . . . 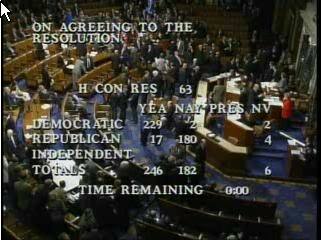 I find the 180 who voted against the resolution more amazing. According to all the polls I've seen, this is likely to cost them dearly during their re-election bids. They have to be already hearing the sound bytes of their opponent going into elections. It makes me wonder how the Party kept that many in line. Personally I'm in favor of following the Presidents recomendation. Congress has many things they could be doing instead. Balance budget, Social Security, Outsourcing of all our jobs, Illeagle immigrants. But no they grandstand this situation. Politics seems to be more a game of pointing your finger at the other guy and tell all that he is doing wrong instead of comming up with real solutions for real problems. It makes me wonder how the Party kept that many in line. "Representative, how are the defense contractors doing in your district?" Question for those who are old enough to remember: While many have derided this as a meaningless vote, it feels like it means something to me, like this represents a gathering of momentum. Do you agree and was there a moment during the Vietnam era that felt the same? Yep. The day I got my "Greetings" letter from Uncle Sam. Personally I'm in favor of following the Presidents recomendation. Congress has many things they could be doing instead. Balance budget, Social Security, Outsourcing of all our jobs, Illeagle immigrants. The war in Iraq seems serious enough to discuss in Congress. Maybe the independent audit that showed $9 billion was misappropriated didn't help?? I thought long and hard about clicking "post" to start this thread, I didn't want to start a flame war (really! ), I just am a fan of history, and I always wonder if a moment is something that will be remembered. I was already working for a defense contractor when 9/11 happened. They turned the main auditorium into a viewing room with the overhead projectors feeding live t.v. coverage. Then we learned that 3 of our employees were killed in the attack on the Pentagon. We all knew everything had changed. Not inspiring. "We want to quit, regardless of the cost to others or our kids" is not a vote that America will be proud of in the future. Luckily, it has no tangible impact. The appropriations bills will have, and Murtha has already spilled the beans on the game plan to undermine chances for our success: Attach so many riders and conditions (mandated max tour lengths, mandated time home, mandated training and equipment levels) that continuing the fight will become impractical, and US casualties will either increase or we'll be forced to leavethe fight is impractical. It is tremendously cynical. Lawrence, your ref to Tet is appropriate. A tremendous defeat for North Vietnam/the VC that was portrayed as a huge success in the US media. There's a lot of that going on. We hear about every bombing. Did anybody hear that Iraq prodced more wheat last year than any time in the nation's history? Not inspiring. "We want to quit, regardless of the cost to others or our kids" is not a vote that America will be proud of in the future. . .
As opposed to, "We want to continue, regardless of the cost to others or our kids"? I don't really understand where you are coming from. This invasion is a disaster. We are not "winning" anything that I can see. And no one seems able to explain how doing more of the same is going to produce a better result. More wheat, huh? Hmmm, you are right, that didn't get circulated. The fact that school attendance for children has dropped from 70% to 30% did, and the fact that there are 2 million internally displaced/refugees. I don't think I'll buy that Iraq is anything other than a complete mess. I referenced the Tet Offensive because while the body count was (as always) in our favor, it served it's political purpose. I mean, the VC did not really think they could hold the U.S. embassy in Saigon, for example, they just knew it would play great on film. Not liking the rules of the game doesn't make it not so. Not liking that Americans have no stomache for long, drawn out wars doesn't make it not so. This is the reality we are faced with, so decisions have to be made in the light of reality. I have coworkers who go around to this day saying, "But we WON the Tet Offensive!" and totally not understanding that's beside the point. In 2005, Cheney said we were seeing the last death throes of the insurgency, about every six months for the last 4 years we've been told it's just about to end. That was a huge mistake. The only slim hope for not having Iraq revert to a dictatorship after an ethnic bloodletting is for us to be there another decade, possibly longer, with many more troops than we have there now. No one is willing to do that, so what do we gain with half measures, like 20k troops to attempt to quell millions of Iraqis? This reminds me too much of the coverage of the fall of Sigon in April 1975. We were watching it on the TV on the mess dack of the CG Cutter I was on. A lot of pissed off service people that day mainly about how the politicians had let down the country for the sake of political expediency (votes). If the Dems would at least come up with a plan other than other than "let's re enact the scene of the last helo off the roof of the Sigon Embasy" I might listen to their BS. However not ONE of the clowns that voted for this "resolution" Dems or Repubs has the courage to say to the public and the president "I have a plan to win this war and bring the troops home." All they can come up with is, lets cut and run just as we did in Vietnam by cutting off funding of the Vietnamese Goverment. What will these clowns do when we get in a knock down fight with Iran or North Korea or some such. We could take 50,000 casualties in one day in the right circumstances. (NUC). Will they be as risk averse then as now, or will they posture for the cameras and demand thet we "do something"? Then again if flight 94 had not gone down in PA but instead hit the White house or the Capitol Building maybe they'd have a back bone. I wonder what they'll say if we do pull out and 6 - 7 million lives are lost in the ensuing violence? Oh I know," its Bush's fault". My friend is running a blog from the camp he's at in Iraq, he says the soldiers moral is just fine, and that they do believe in what they are doing. No bias in the media folks, move along.
. . . However not ONE of the clowns that voted for this "resolution" Dems or Repubs has the courage to say to the public and the president "I have a plan to win this war and bring the troops home." . . . But I think the point you are missing is that most people now realize that our invasion unleashed a civil war that doesn't involve us except as referee. The referee can't win. It makes no sense to continue to give up lives to referee Iraq. What could possibly happen over there at this point that would make us a winner? What will these clowns do when we get in a knock down fight with Iran or North Korea or some such. is the worst foreign policy decision in US history. the world simply laughs when Bush says "Iran has nukes" etc. Congress for responding to the will of the people and saying "enough is enough ?" And yes, it IS Bush's fault. I guess we can all quote the soldiers in Iraq to support whatever our position is. He admitted that not all soldiers there would agree with him, but a substantial number do. Certainly, they all have their own opinions, I just mean guys are lounging around listening to Jefferson Airplane and smoking joints while talking about fragging their CO. I just don't see an endgame, other than partitioning the country. The sectarian violence is spreading. There was a car bomb in Iran today. Maybe the Sunnis are taken' it to the source. Would be kinda interesting if Iran got a taste of what they have been formenting for 30 years or so.